There is no doubt about which is the most frequent question that I get asked by readers. That question usually comes in some form of "I want to move to the Phoenix area. Please tell me where you think I should live." Or, "I am moving to the Phoenix area with my family. I am looking for a safe neighborhood with good schools. Where should I look?" I'll be honest. I dread those questions every time I get them. That's because I can't really answer them. I wish people would stick to the simple questions, like, "How do I find a swap meet?" or "Where is the best place to get baseball players' autographs during Spring Training?" or "Where are the farmers' markets?" Those I can answer! Without knowing you or your family, it is impossible for me to advise where you should live. So when I get asked this question, I usually break it down into questions right back at you. At least maybe this will help to organize all the parameters down into manageable pieces. Then you can do the research and come to reasonable conclusions. Many people don't realize how big the metro Phoenix area is. The City of Phoenix, itself, is the 5th largest city in the country. Geographically, metro Phoenix is pretty spread out. It covers over 9,000 square miles. Phoenix is the largest city in Maricopa County. Maricopa County has a population of over 4,000,000 people (2013). It is the fourth most populous county in the nation. Maricopa County has more people than 20 states and the District of Columbia. The Metro Phoenix area, as defined by the U.S. Census, includes both Maricopa and Pinal Counties, and is made up of many cities and towns. This can make the decision of where to live a bit complicated. Apache Junction (partial), Avondale, Buckeye, Carefree, Cave Creek, Chandler, El Mirage, Fountain Hills, Gila Bend, Gilbert, Glendale, Goodyear, Guadalupe, Litchfield Park, Mesa, Paradise Valley, Peoria, Phoenix, Queen Creek, Scottsdale, Surprise, Tempe, Tolleson, Wickenburg and Youngtown. Agua Caliente, Aguila, Anthem, Arlington, Camp Creek, Chandler Heights, Circle City, Cotton Center, Desert Hills, Freeman, Gladden Hassayampa, Higley, Hopeville, Laveen, Liberty, Maricopa Colony, Mobile, Morristown, New River, Nortons Corner, Ocotillo, Palo Verde, Perryville, Rio Verde, Santa Maria, Sentinel, St. Johns, Sun City, Sun City West, Sunflower, Tonopah, Wintersburg and Wittman. Of these, only Anthem, Chandler Heights, Desert Hills, Higley, Laveen, New River, Ocotillo, Perryville, Sun City, and Sun City West are close by and could be readily considered part of metro Phoenix. Some cities that are in other counties are actually relatively close, and it is common to find that people who live in those cities work and play in Maricopa County. Those cities are Apache Junction (partial), Florence, Globe, Miami, all southeast of Phoenix; Maricopa, which is southwest of Phoenix and Casa Grande which is south of Phoenix. One of the most unique aspects of the Valley is that almost every single city and community has nice areas and areas that are not as nice or should be avoided. It is not possible to come up with a list of nice areas, or areas to avoid. Unlike other major cities, neighborhoods change very rapidly here. You can be in a very nice upscale neighborhood, travel a few blocks in a particular direction, and find it run down or seedy. There are certainly some areas where you can be certain that you'll have wealthy neighbors--but I can't guarantee they will be pleasant! 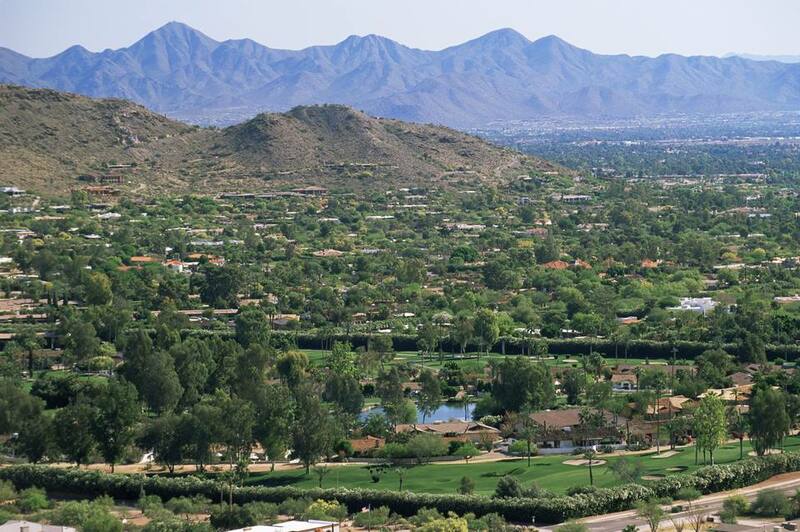 So if you have a million dollars or more to spend on a home, Paradise Valley (between Phoenix and Scottsdale) or the Biltmore Estates (central Phoenix) or basically anywhere on a mountain or in the foothills of the mountain will be where you'll be looking. Back to the point of this paragraph: it is very difficult to judge a neighborhood without seeing it. Even Scottsdale, known as a playground for the rich and famous, has areas that are not as pleasant as others. Unless you enjoy downtown urban living, you'll find that the suburbs are where people want to live. That's where there are restaurants and malls and movies and backyards and barbecues, etc. Avoid living near the main campus of Arizona State University, unless you are an undergrad. Again, if you think about it, this makes sense. No one owns, everyone rents, everyone is very young and transient. Properties may not be cared for. If the rent/cost of the home seems too good to be true, it is. There are no bargains here. You will not find an apartment for rent for $350/month. You will not find a home in a nice area for $70,000. Rental charges and home prices are certainly cheaper than some cities, like San Francisco or New York, but they are pretty much on the national average. This one is also common sense, but avoid living on a major street or a highway if you can. The farther you get from traffic, the less noise and aggravation you'll have, and the less likely you'll have strangers driving around your neighborhood. When selecting a neighborhood, go there during the day, and then visit at night. Look at who your neighbors will be, and the types of cars on the streets and in the driveways. Look at the neighborhood businesses and decide whether they suit your needs. If you know where you will be working, decide how long you are willing to spend getting to and from work. Then, on a map, draw a perimeter of places that fall within that acceptable distance. You'll need to take into account whether or not you will be traveling during rush hour and on a path that is affected by rush hour. If you are living in Chandler and commuting to Deer Valley, and you work from 8 to 5, you'll be spending a lot of time in your vehicle. If you are working the 3 to midnight shift, living in Surprise and working in Sun City, traffic is not a factor. Tip: The sun is very bright much of the year, and there are some people who would rather not drive into the sun. You might want to consider this when planning your commute. Driving west into the afternoon sun can be a frustrating experience, five days a week. If you are looking for schools for K-12, there's no easy way to find out which schools are better than others. You will just have to 'hunker down' and do the research. There are web sites where you can learn a great deal about the schools in each of the school districts, including class sizes, scores on standardized tests, and teacher experience levels. There are public schools, private schools, and charter schools. Depending on the schools and the grade, you will have to contact the school district to find out if your child can get in if you decide to move nearby. Remember--not everyone can send their kids to the school with the best academic records. But that might not be necessary to get a good education for your child. How much can you afford on a monthly basis for your living expenses? Be conservative. When researching apartments, remember that some apartment complexes have utilities included, and some do not. Some have pet charges. Some include cable fees. Make sure you ask all the questions and know exactly what your monthly expenses for living will be. These items could make hundreds of dollars difference to you each month. When buying a home, make sure you understand what your utilities will cost: electricity, gas, trash pickup, cable, phone. Water bills are sometimes a surprise. Find out if there is a Homeowners Association ("HOA") and what the annual cost is. Once you buy a home, the HOA dues can be raised and you have no choice but to pay the increased amount. How Much Will My Electric Bill Be? What do you like to do? If you like to go to the theatre or see professional basketball or baseball, you might want to make sure your trip to downtown Phoenix is easy. If you enjoy professional hockey or football, then Glendale will be a consideration. If you want to be a member of a country club with golf, there are plenty of choices, but you have to find them. If you enjoy walking your rottweiler in a park in the morning, then proximity to a nice area with walking trails or a dog park will be important. Are you interested in nightclubs and nightlife? Ethnic communities or areas where there is a concentration of people of a certain religion? Do you need to be near a hospital? That will be just one more consideration. Do you need to be within walking distance of public transportation? That will limit your available perimeter, too. Think about the things you do or need, then decide how far you are willing to be from them. If you like to water ski or have a boat, proximity to a lake may be important to you. If you enjoy going up to northern Arizona to enjoy the red rocks of Sedona or to hit the slopes in the Flagstaff area, you'll want to live in the northern part of town. If you enjoy going to Rocky Point, Mexico for the weekend, or to Tucson, or you will be visiting a loved one in Safford's State Prison, you might want to live in the southern part of town. If you travel to Palm Springs a couple of times a year, maybe you should situate near I-10. I think you get the point. If there are specific places that you'll be traveling from your home base, it only makes sense to cut down your travel time by more than an hour by locating in the appropriate part of town. Do you want a brand new home in a gated community with amenities and activities? Do you want an older home that is not a cookie-cutter-type subdivision home? Do you want a home in a historic neighborhood? Do you want a home in an empty-nest community, like a retirement community or an adult resort living community where no children are permitted? Do you want acreage or horse property? You can find it all in metro Phoenix, but if you are looking for a specific type of home or community, that will help to narrow your search. Everyone wants to live in a safe neighborhood. You can find crime just about everywhere, but some areas are more prone to violent crimes than others. For instance, it will not be a surprise to area residents that the Maryvale section of Phoenix has had more violent crimes than other areas. This area has a reputation for gang activity. Almost every city in the metro Phoenix area has crime statistics that you can use to aid in making your decision. There are so many neighborhoods to consider. To make it more confusing, there are areas that look exactly alike, with the same stores and restaurants and amenities but on opposite sides of town. There are areas that are older with more charm, and those that are newer and cleaner. There are places that still have horse property and acreage, and there are new condo and loft apartments in urban centers. I always recommend, if possible, that people rent first to afford themselves time to become acquainted with the area and find the neighborhood that just feels good. Yes, it probably means moving twice, and putting some of your belongings in storage. But isn't that better than investing in a home in a part of town that you don't like? Now, your job is to take these criteria and put them in the order that is most important to you. Prioritize. Then print out a map and narrow down your search to those areas that meet your family's needs.